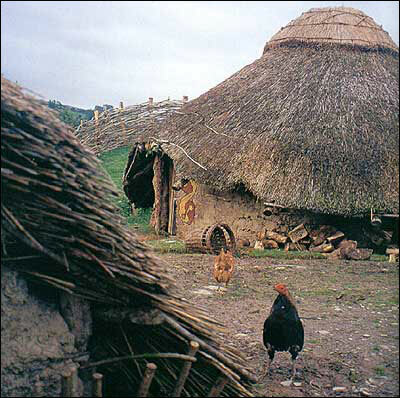 Prehistoric Lifestyles: Building as Climate Allows Humans exist at the mercy of the environment, and when climate is welcoming and stable, humans can't resist taking the opportunity to move into some new real estate. John Lord helps modern-day humans get a taste of prehistoric times. He makes Stone Age tools and demonstrates their uses for students and archaeologists. With a warm, stable climate, our early ancestors devoted time to improving their tools. 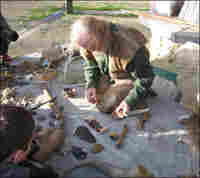 Above, John Lord exhibits some of the tools he has made, modeled from tools made during the Stone Age. Once upon a time in Britain, moors were covered in golden wheat and vineyards flourished. Now, farmers are flirting with England's first tea crop. What gives? The archaeological record shows that as temperatures shift, farmers try out new crops in new lands. 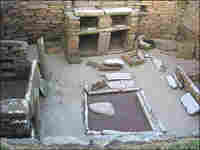 Read the story and see animations of Bronze Age village life. The stone village of Skara Brae was built approximately 5,000 years ago. Each house has a large square room with a fireplace, two beds, and a dresser with shelves. 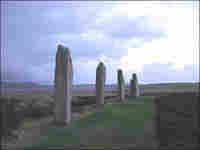 The Ring of Brodgar is a Neolithic stone circle. It is estimated that the massive circle of stones was erected between 2500 BC and 2000 BC. There's a child's toy called "Etch a Sketch." Perhaps you remember it? You use it to make intricate designs on a screen, then give the screen a shake — and your drawings disappear. That's pretty much what happened to Northern Europe and the British Isles during the last ice age. For the past 10,000 years or so, Britain's climate has been welcoming and it has allowed humans to comfortably settle in. But during the last ice age, these areas were uninhabitable. 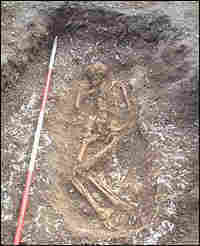 "It's very cold, [and] it's treeless," says Clive Gamble, an archaeologist at the University of London. "In some places, it's described as polar desert. It's not somewhere you'd want to be." There were early humans in Britain before the ice arrived, but when it got too cold, they fled to Southern France and Spain. After a while, the ice began to melt, and Gamble says the humans began to see Northern Europe as habitable — it was "a brave new world," he says. Things were comfortable down in Southern France and Spain, so why did people head into the complete unknown up North? Perhaps people just need to explore wherever the climate lets them. "What we're getting is some tantalizing glimpses," Gamble says, "that actually they start to look into these northern areas long before the plants and the animals have really returned there in sufficient numbers." Humans explored this brand-new real estate and then gradually moved their families. By the time the whole clan had settled in, the warm climate had attracted a rich supply of fauna — reindeer, horses, bison and mammoths. The settlers were always developing new technologies to help them hunt. John Lord helps modern-day humans get a taste of prehistoric times by making Stone Age tools and demonstrating their uses. Lord looks like he just stepped out of a caveman diorama. He has wild hair and a long beard. 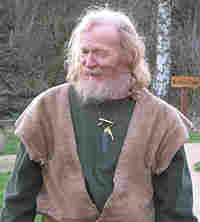 He wears animal skins for clothes, and has a flint knife stuck into his leather belt. "I'll introduce you to a Stone Age mobile phone," he tells a group of elementary school students watching his demonstration. He holds up a large animal horn. "If you blow a raspberry into it," Lord says, "it makes a noise like a mammoth." It's the perfect trick for bringing a large beast into spearing range. "If you're not as hungry," Lord says, "you can make a different noise — wild boar." With a stable climate, our early ancestors had the time to improve on their tools; heavy flint hand axes gave way to lighter blades attached to wooden handles. Less than one mile from where Lord is talking with the schoolchildren, there's a limestone ravine known as Creswell Crags. There are caves at Creswell where ancient hunters retreated to enjoy their mammoth steaks and take refuge from the cold. If you look closely, you can see something uniquely human that they left behind: Hidden in a dark spot on the ceiling of a cave, there is a drawing of what is thought to be an ibis. Ian Wall, the chief archaeologist at the Creswell Crags Visitor Center, says archaeologists had been coming to the site for more than 100 years before the material was spotted. To tell the truth, the ibis isn't really much of a drawing. But it gives a sense of what was to come. Humans continued to search for the good life; they even sought opportunities for leisure activities. This exploration took humans to the Orkney Islands, north of Scotland. Once upon a time, the climate here was actually warmer than it is today — so comfortable, in fact, that some of the nomadic hunters stopped their wandering ways and put down roots. There was abundant seafood, and because Orkney has virtually no trees, starting a farm was a snap. Luckily for archaeologists, the lack of trees also meant everything was built out of stone — and was therefore pretty permanent. The Stone Age village of Skara Brae is an example of what a stable climate makes possible. Skara Brae is a planned community dug into a dune along the beach. It was built about 5,000 years ago. "Looking down from the top," Gibson says, "we can see the big bed on the right, the dresser in front of us, the little bed on the left, and all the little cupboards and things which maybe you put you're milky drink in when you went to bed at night." 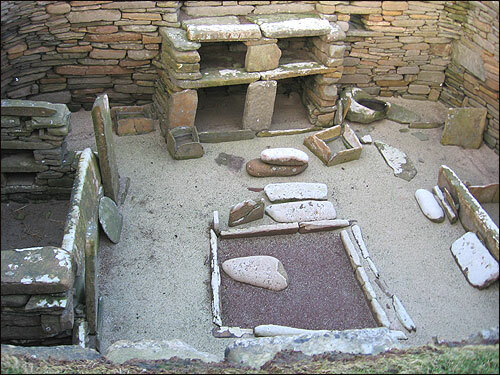 The architects of Skara Brae liked order; all of the rooms basically have the same layout. As people began living in more complicated societies, ritual became more important. 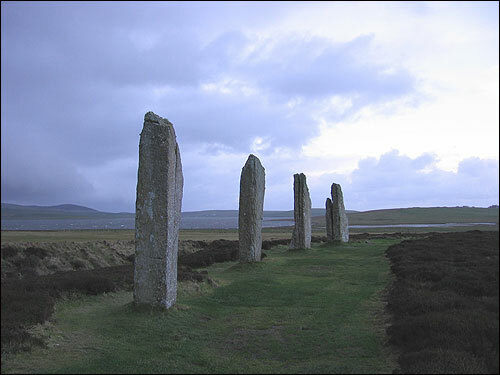 The Ring of Brodgar is a Neolithic stone circle on the Orkney Islands. It sits atop a hill, surrounded by a mix of freshwater lakes and ocean. It is estimated that the circle of stones was erected between 2500 BC and 2000 BC. The 104-meter-wide circle originally contained 60 megaliths, of which 27 are still standing today. It is an impressive jump from a simple cave drawing to a massive stone circle. Yet, as the climate remained stable for thousands of years longer, the stone circle led to pyramids and temples and cathedrals and who-knows-what to come next — provided that climate change doesn't wipe the slate clean. 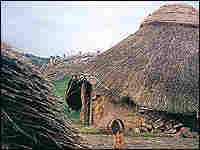 Britain's population in the Bronze Age was mostly rural, composed of small villages of roundhouses, like this re-creation. Crops and grain were stored in similar structures. The British really love their tea. It often trumps coffee in the morning, and in times of crisis, a cup of tea is the first thing Brits reach for. But one crucial detail has kept it from being the "true" national beverage: Britain's climate is unfit to grow it. Every leaf in every bag must be imported from somewhere else. That is, until now. Last summer, Ian Pearson, Britain's minister of state for climate change and the environment, urged British farmers to "seize opportunities for new crops that a changing climate is going to bring." Pearson spoke of soybeans filling English fields, of land in cold, wet climes — long unsuitable for farming — soon blossoming under the plow. He even bragged about England's very first homegrown tea crop, now growing in Cornwall, in the southwest of the country. But Pearson's visions aren't merely futurist dreams; some were once reality in Britain's much warmer past. Some 7,000 years ago, during the Bronze Age, the average temperature in Britain rose almost 4 degrees Fahrenheit above today's norms. Martin Carruthers, an archaeologist at Orkney College of the University of the Highlands, says he usually turns to social and cultural explanations for historical agricultural changes. But he says it's hard to deny that the balmy Bronze Age significantly altered land use, allowing ancient farmers to bring their crops to previously uncultivated areas. For instance, golden fields of wheat and barley flourished in the soggy, scrubby upland moors that are strewn throughout Britain's higher elevations. In today's climate, those areas are wholly unsuitable for farming. "We've never really seen the same expanse of territorial ground covered in Britain since the tail of the Bronze Age," he says. But as the Bronze Age closed, around 700 B.C., the climate cooled and steady rains returned. Moors and bogs retook the land, and the farmsteads of northern Britain were abandoned, becoming relics for archeologists to discover thousands of years later, buried under layers of peat. Carruthers says the transition happened so quickly, it became known as the Bronze Age crash, and is seen as evidence for the swift and dramatic effect climate changes can have on agriculture. "It is very much the period that most people would think of immediately as far as farming responding to climatic changes," Carruthers says. 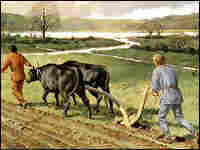 Agriculture boomed again during the Middle Ages, when Britain entered a long stretch of stable, mild weather. Farmers once more flirted with the edges of the upland moors. Wine grapes were brought into the country and cultivated much further north than today's climate permits. Partly in response to the bounty, the population skyrocketed. But trouble was again on the horizon in the form of another cooling event, one that would last 500 years and come to be called the Little Ice Age. In his book, The Little Ice Age: How Climate Made History 1300-1850, Brian Fagan chronicles the effects of this period, starting with the Great Famine of 1315. That year, areas of atmospheric high pressure over Iceland and lows over the Azores Islands switched places. Instead of bringing warm Atlantic winds into Britain, this new climate system brought winds in from places like Siberia and the North Pole. Winters became bitterly cold, and it rained so often that fields turned into shallow lakes before they could be planted. Entire harvests were laid to waste. Millions of people died from starvation and disease, their plight compounded by extreme poverty and an ineffective government. The famine lasted for seven years, until the pressure system in the North Atlantic reversed. But that didn't mean stability. In fact, weather patterns became more erratic, bringing on the Little Ice Age that, among other things, pushed farmers back out of the moors and led to the abandonment of England's wine industry. It is another example that, as Fagan writes in his book, "humanity has been at the mercy of climate change throughout its entire existence." Today, of course, technology helps mitigate some changes in climate in Britain. Farmers fertilize and irrigate crops on large scales. Grain is stored in climate-controlled silos. But climate change can still affect modern agriculture. Case in point: the Tregothnan Estate in Cornwall. It's producing a flagship tea crop in a climate that resembles India more than England. Jonathan Jones, head gardener at the estate, says his corner of Britain has always enjoyed a mild climate. He wasn't even thinking about climate change, he says, when he planted his first tea bushes in 1996. Still, Jones says, the last few years have been milder and warmer — and particularly good for growing tea. "[We're] not seeking climate change," says Jones, "but if what we've been experiencing is warming, then so far it's been beneficial." Of course, history has shown that such perfect climate conditions are never guaranteed in Britain. In fact, the latest report from the International Panel on Climate Change predicts the current warming will mean dwindling summer rains and unpredictable weather patterns. Both are a concern for farmers like Jones, who would prefer no change at all. "Trouble could be brewing if we got lots of dry summers," he says. "And of course ,we also don't want frost during the growing season." But for now Jones is enjoying the weather, proud to be the first farmer offering, "English tea grown on English soil."